When it comes to romantic settings, the sights on the tiny island of St. John in the USVI are hard to beat. 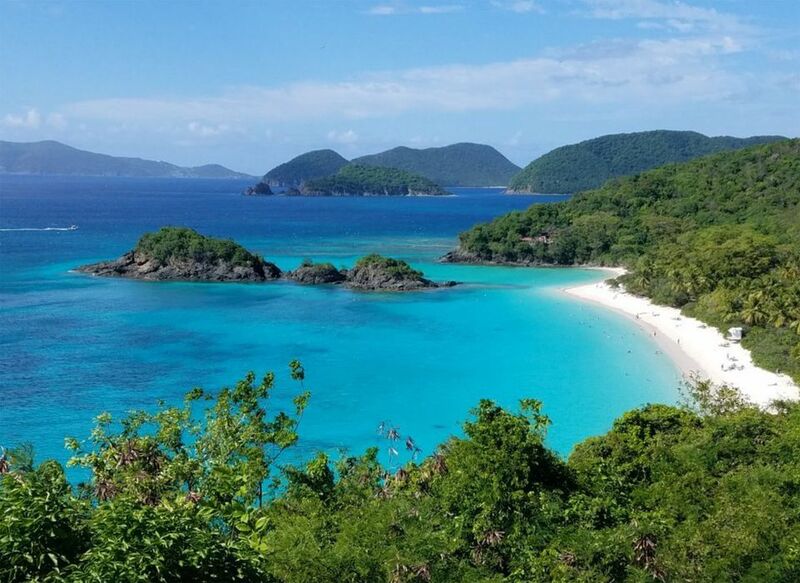 Two-thirds of 20-square-mile St. John is a national park, with lush hills and pristine beaches untouched by development. All of St. John provides the ideal place for honeymoon couples and other romantics to celebrate, so much so that it’s earned the nickname “Love City.” There are a few particularly outstanding spots perfect for a memorable moment — and a kiss. While its name may not sound romantic, St. John’s sprawling Gallows Point Resort is as beautiful as the views from its shores. Its manicured grounds include a charming gazebo that overlooks Cruz Bay. When it’s not being used for a wedding, it contains a rope hammock for two. Gaze out at the bay and enjoy one more memorable kiss—or pull on your flippers and go snorkeling in the warm, inviting waters. Trunk Bay is one of the most photographed beaches in the world, frequently showing up in ads and fashion shoots. It is also the most popular spot on the island for sunset weddings. Take advantage of this spectacular white sand beach, a gentle half circle curving around turquoise water. Anyone who ever claimed to enjoy long walks along the beach will find the ultimate experience in this memorable spot. Peace Hill, located on St. John’s northwest coast between Hawksnest Bay and Denis Bay, affords truly spectacular sights guaranteed to inspire a smooch. Reaching this memorable USVI spot requires a short walk along a trail that begins about a half mile east of Hawksnest Beach. From atop the hill, there’s a fabulous 180-degree panoramic view of St. Thomas, Jost Van Dyke, Little Jost Van Dyke, the British Virgin Islands, and the turquoise water that surrounds them. Bordeaux Point is the highest point on St. John in the USVI, rising up nearly 1,300 feet above sea level. Driving along Route 10 takes travelers close enough to the top of Bordeaux Mountain to enjoy amazing views of St. Thomas, St. Croix, and the British Virgin Islands. Annaberg Plantation is the remains of an 18th-century sugar plantation, with an abundance of greenery and flowers bursting among the stone ruins. Climbing up a path takes visitors to a scenic overlook with fabulous views of the British Virgin Islands and the turquoise waters below. There’s always a breeze, making this sight perfect for kissing. The Reef Bay Trail is a two-mile trail that begins at Centerline Road, descending from the top of a mountain to the beach. At the bottom, couples will walk amidst petroglyphs, ancient markings on rocks at the bottom of the trail. The greenery and views make this an extremely romantic spot. Because the walk back up is fairly strenuous, couples may want to arrange in advance for a boat to pick them up on the beach. St. John in the USVI is one of the best places in the world to sight the sunset, making a twilight cruise in any of its breathtaking bays a terrific spot for a kiss. In addition to a sky streaked with color and the soft blues and greens of the sea, add music, cocktails, and some tasty hors d’oeuvres and you’ve just created an unforgettable experience. St. John’s luxurious Caneel Bay resort not only occupies one of the most scenic parts of the island; it is also dotted with the ruins of an 18th-century sugar plantation. Visitors to the island can arrange to have dinner among the ruins, complete with candlelight, white linens, and their own waiter. Indulge in fine food and wine under the stars. Note: Caneel Bay was devastated by Hurricane Irma. Rebuilding efforts are underway. The resort is closed at this writing, but check with the website for updates on when it will reopen. Hawksnest Bay is considered one of the most beautiful beaches on St. John in the USVI, as well as the most convenient. It also offers terrific snorkeling. It’s hardly surprising that it’s an extremely popular spot for both tourists and locals. Yet the specialness of this spot makes romantics forget about everyone else on the beach. The snorkeling off Waterlemon Cay is said to be the best on the island. A mere 500 to 600 yards offshore, snorkelers are likely to spot such rarities as starfish and seahorses. Yet the water is shallow enough along the shore to make this scenic sight a great place for a kiss. What Are The Top US Virgin Islands Activities for Families?